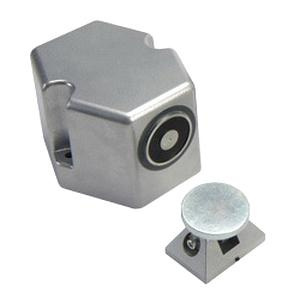 Edwards Electromagnetic door holder features die-cast aluminum housing with powder epoxy finish for corrosion resistance. It has a dual voltage rating of 24-Volt AC/DC and 120-Volt AC, current rating of 0.015-Amp. Flush floor section houses the electromagnet while the contact plate attaches to the door. Explicitly it is suitable for use with 1-doors, used on fire alarm, smoke detection or sprinkler systems. Door holder is UL/cUL listed and meets CSFM/FM/MEA standards.